Positivity affects perceptions, attitudes, and expectations. Positive emotions have been shown to increase feelings of energy, help you cope with adversity, and feel more optimistic about life. To successfully survive we need to create a positive culture that promotes camaraderie and teamwork. 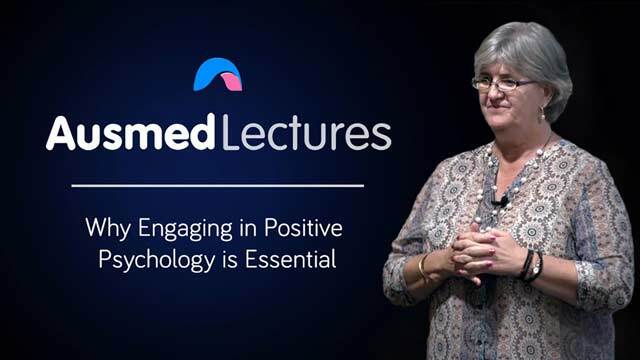 This lecture offers a great tutorial on using positive psychology to help you function in the day-to-day stressful environment healthcare workers face. Veronica Mercer worked as a nurse for 15 years in community and hospital settings, and now works in private practice. She is an Accredited Mental Health Social Worker and has a Bachelor’s degree in Counselling. With over 17 years’ experience in the field of counselling and psychotherapy, Veronica has worked in all aspects of mental health care. A large focus has been on teaching emotional intelligence and building skills for developing resilience for all of life’s transitions. Veronica is also a Mindfulness Practitioner and incorporates this into her therapy in a practical and functional manner. Good session, it would be great to see PP slides. Interesting topic with useful information. Presentation could be improved by the visibility of the slides.